I would like to give you a bit of my 6 months experience in the CCC November through April of 36-37. I signed up for six months to carry me through the winter months, when there were so precious few jobs available during the winter around Boise Idaho area. We were just beginning to slowly recover from the terrible depression. The recovery was certainly due in part, a very large part I feel, to F.D.R. 's programs such as the CCC which took a very large number of men from all over the nation and put them to work, mostly in the western and north western states, controlling tree infections from attacks of "blister rust", planting trees in the forestry, building roads, etc. I lived in Emmett, Idaho near Boise where I entered the C's and spent 6 months at Alexander Flats Camp F-175 - Company 971 along the Boise River 67 miles above Boise. 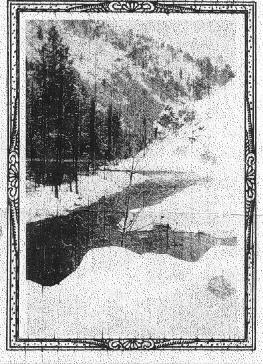 We worked all winter building a road on farther into the mountains to Atlanta, Idaho, a mining town - during the winter of 1936- 37. 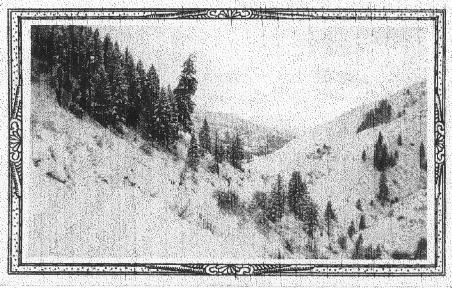 I went to Boise only twice in that 6 months, a very cold ride of 67 miles in the open bed of a forestry truck covered only with canvas- no heat in sub-zero weather and on one such trip some time in February an avalanche had covered the road a few miles below camp and we all turned to with shovels to open an opening to allow the truck to pass through. Needless to say, the comfort of the rec room was more inviting than the trip into town that winter. Five feet of snow was normal for this area. The Boise River which ran near the camp becomes a white water river as the snow melts in the Spring. The area around was very scenic. Along the River one could see strings of deer and elk headed downstream daily. One could get a nice view from Buckers Point, which was on the river above the camp. 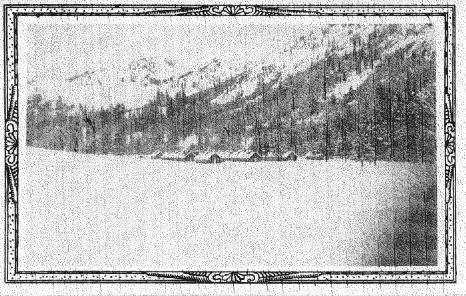 I took photos of the camp and nearby scenery on one of my many walks near camp, on January 10, 1937 (the photos shown on this page). My older brother Calvin Smith, spent 2 years in the C's, coming out as an experienced cook, in May 1936. I later worked in the mines at Atlanta, Idaho, only 20 miles up river from the Alexander Flats CCC camp (which there is no sign of its existence at all anymore) as I have driven past the site many times over the years and always felt a bit of nostalgia of my short time there. I'm now 86 years of age.